These last few days of summer hold memories of weeks past and expectations of weeks to come. Flowers are transforming into fruits and leaves are turning from shades of greens into hues of yellows, reds, and oranges. 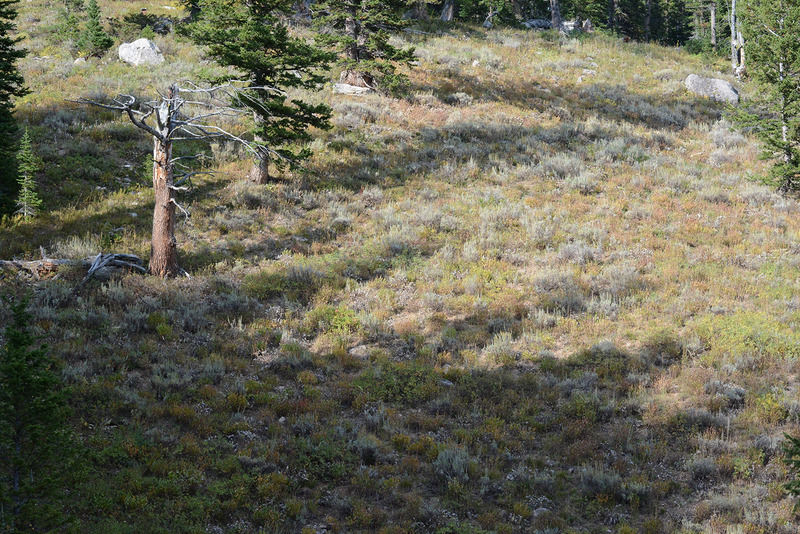 Shadows lengthen as days shorten upon the montane meadows of Ski Lake Trail, Bridger Teton National Park. Several wildflowers are still blooming, although they look rather ragged. Most are members of the Aster Family and sport many guises. 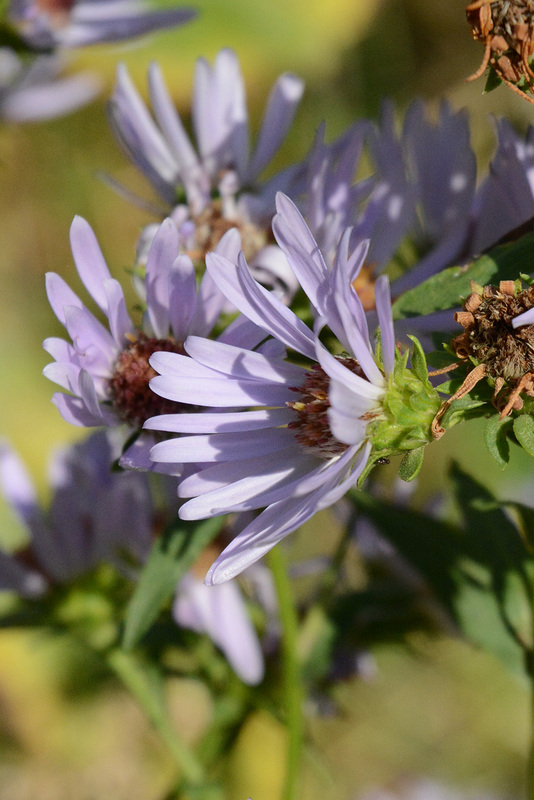 The typical “aster” flowers attract the final, almost “desperate” pollinators, which are clinging to flower heads seeking remnant nectar and pollen. A few sunflower-like species still shine along roadways. Other flowers are individually very discreet, at least until they bloom together in such forces that you can’t fail to notice the yellow cast of pollen. And yet another species just stinks. A bee digs deep into the elongate violet-blue flowers surrounded by the armor of thick bracts. Nearby, wind teases out tuffs of fluff, which carry seeds of Musk Thistle into unknown adventures…likely to become pests on nearby lands. 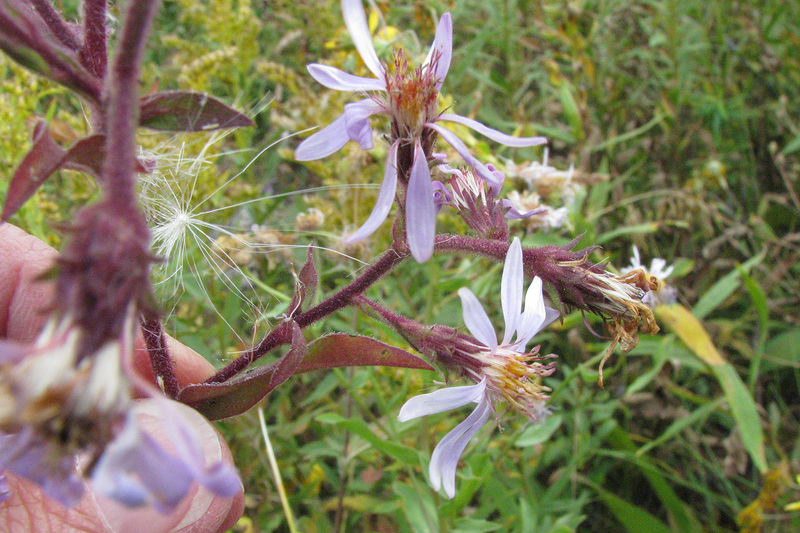 The bracts are loose, leaf-like shingles encircling the head, hence the name Leafybract Aster. (Note these larger outer bracts may or may not be there. Look at several flowers to see). The elongate leaves of Leafybract Aster cling more and more closely while alternating up the 16”-30” stems. Note the many pale ray flowers and the relatively wide leaves which are typically <7 times as long as wide. 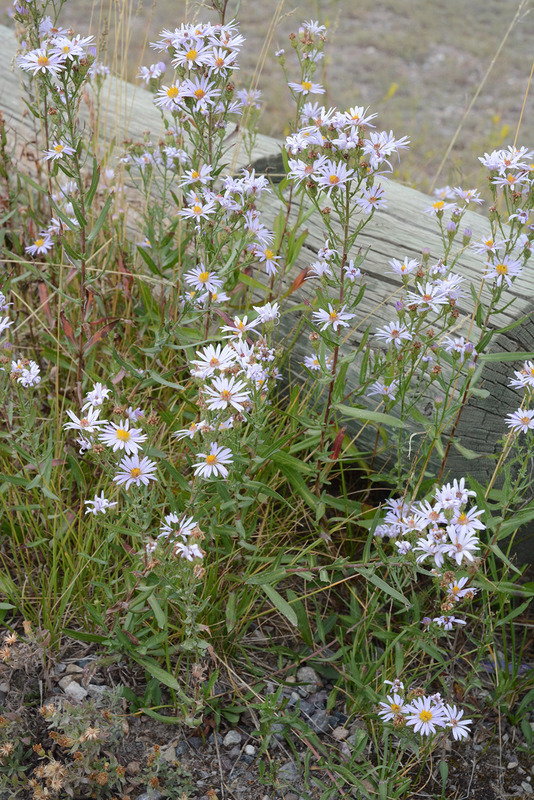 Pacific Aster – Symphyotrichum ascendens – is a very common aster along roadsides and trails. 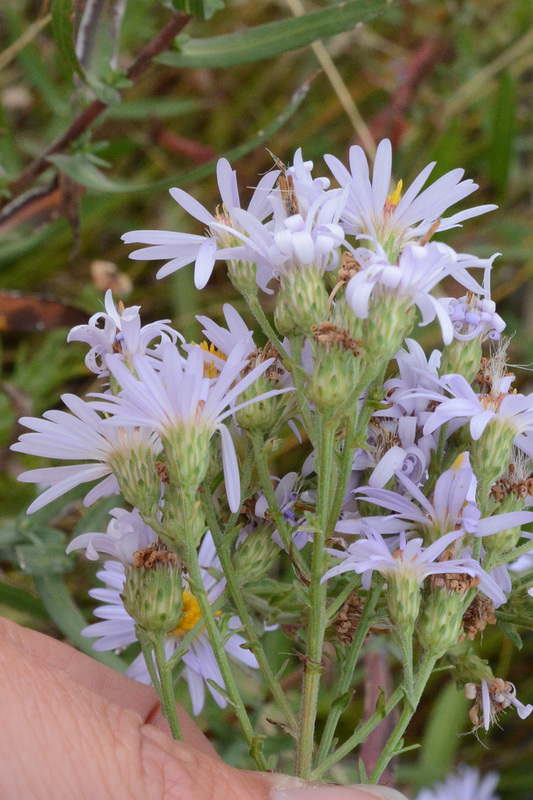 Pacific Aster is overall a smaller and bushier plant than Leafybract Aster (above) with the upper part of the 1-2’ stems covered with pale lavender flowers. The leaves are long and narrow >7x as long as wide. The bracts of Pacific Aster are narrow, sharp pointed, and tightly held against the heads. 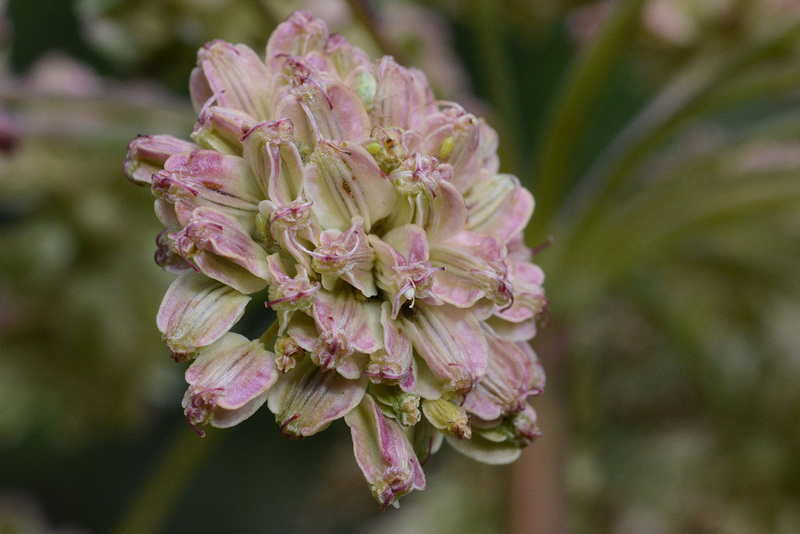 The lower, outer bracts are much shorter than the inner upper bracts. The flowers of Thickstem Aster – Eurybia integrifolia – attract attention due to their larger size. In Thickstem Aster the relatively few ray flowers are an unusual intense violet-blue. The inner disc flowers begin yellowish turning purple. 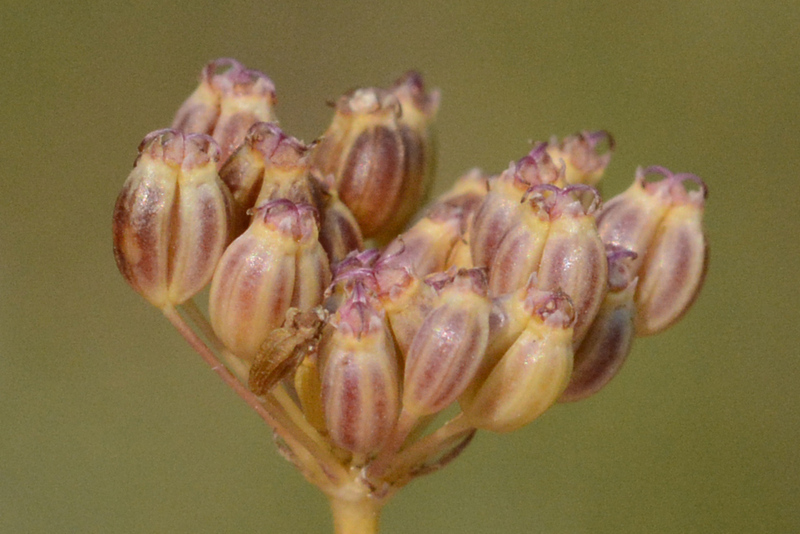 Looking closely, you can see that the flower heads and stems have many sticky glandular hairs, a very helpful ID feature. Often these parts turn deep purple. 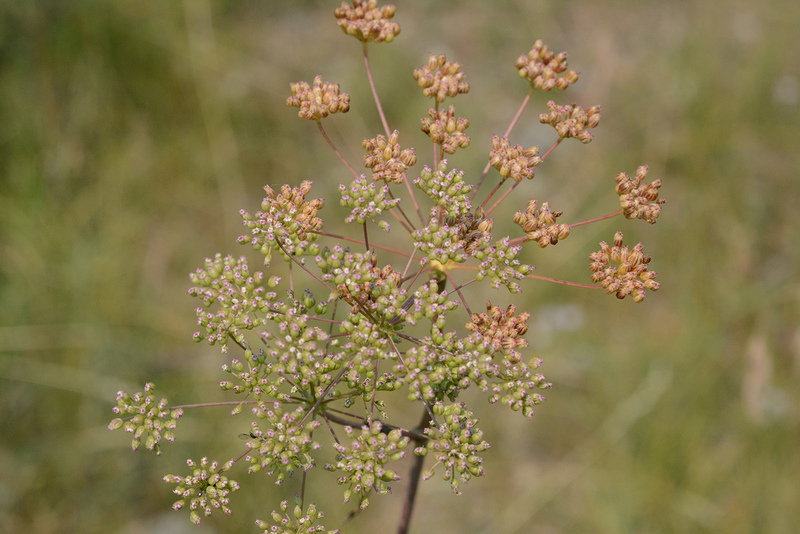 The upper leaves clasp the thick, slightly zigzag stems. 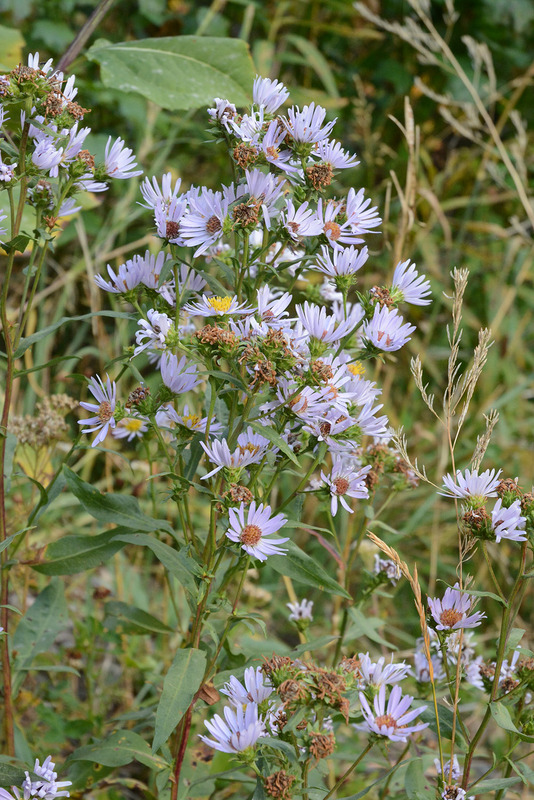 Overall the plants are heftier (and certainly stickier) than the two aster species described above. 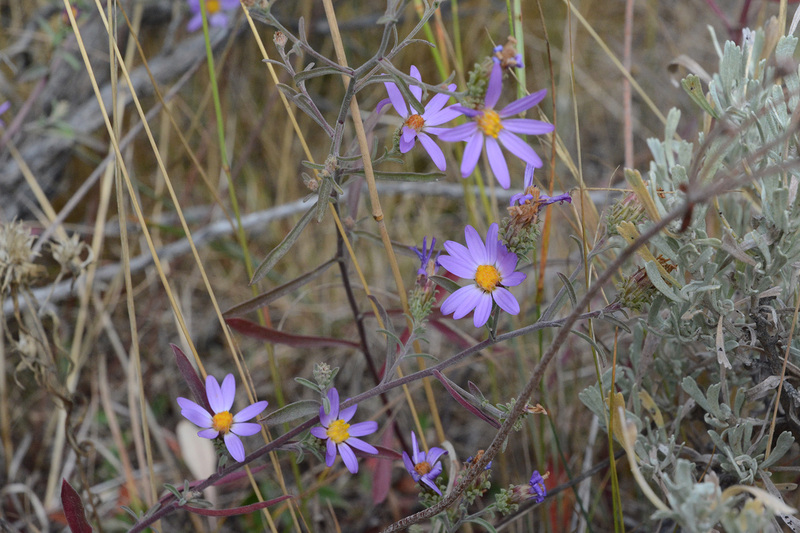 Hoary Spiny Asters – Machaeranthera canescens – are still blooming on sage flats and other dry sites. The delicate looking plants are deceptively durable. 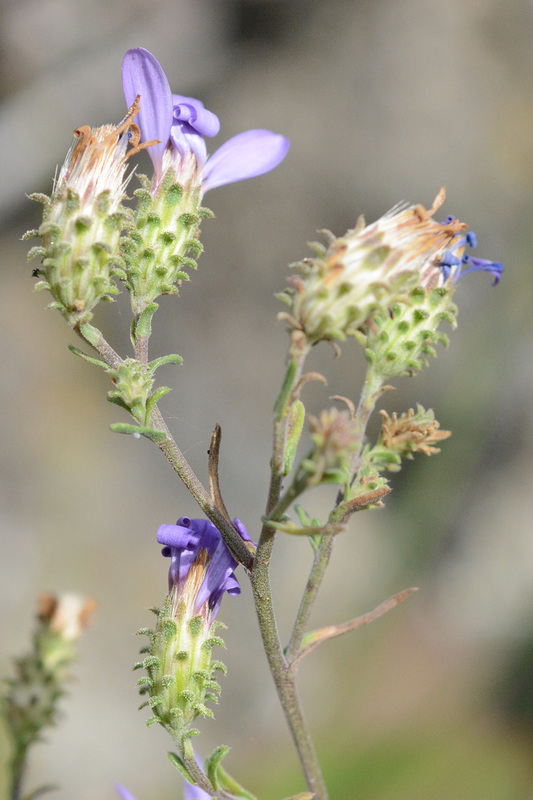 The violet blue flowers of Hoary Spiny Aster catch the eye along Granite Canyon Trail. Tiny silvery hairs on stem and leaves reflect back intense light, reduce wind velocity, and shade the surface of the plants, thereby keeping the plants from transpiring too much water on hot windy days. Two sunflower-like flowers persist along roadsides and trails. Showy Goldeneye – Viqueria multiflora – continues to stare at you along portions of Ski Lake and History Trails near Teton Pass, as well as, roadsides of Grand Teton National Park. The 2-3” leaves are opposite and have pinnately veined leaves. The golden ray flowers pale towards their tips. The wiry plants average about 2’ tall. 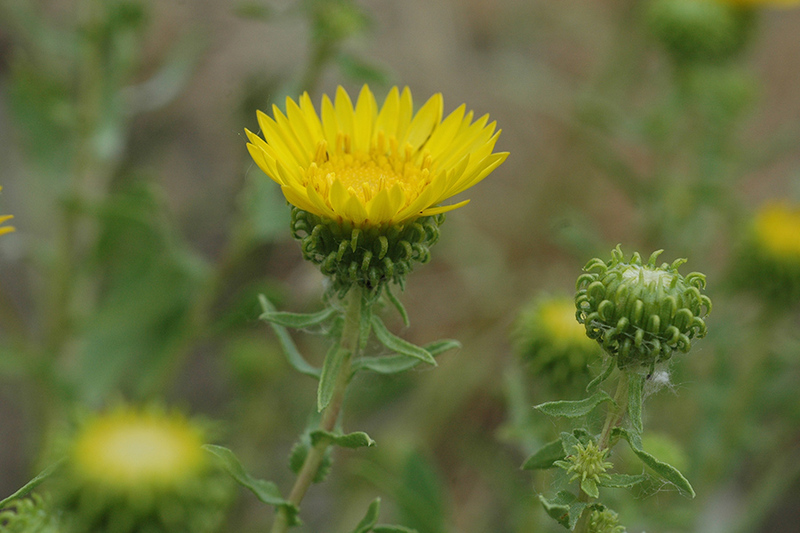 Curly Cup Gumweed—Grindellia squarrosa – is easy to recognize. Resinous bracts curl back and stick together to form spiny cups which beam brilliant rays of sunshine. They thrive along dry, disturbed edges of the inner park road. 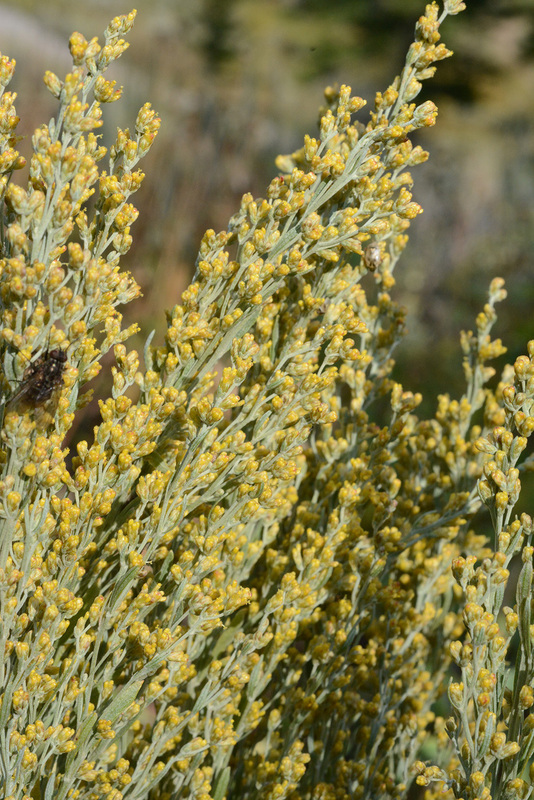 It is easy to overlook the fact that the Big Sagebrush – Artemesia tridentata var. 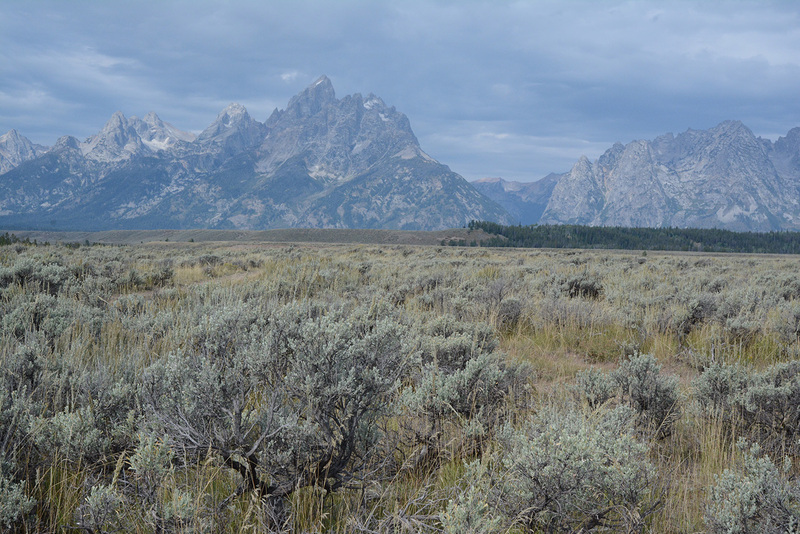 vaseyana – is in full flower right now in parts of Jackson Hole. 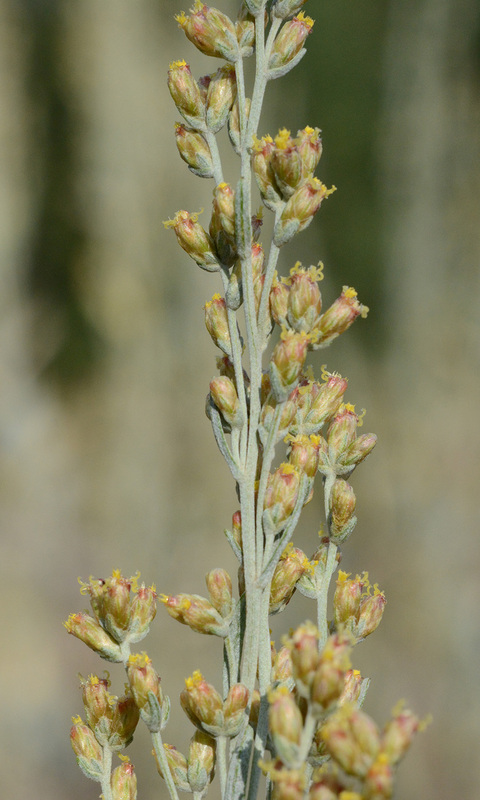 With Big Sagebrush, only a few individual flowers form the tiny flower heads, which are easily overlooked. Look carefully for the arching stigmas that will capture windblown pollen. 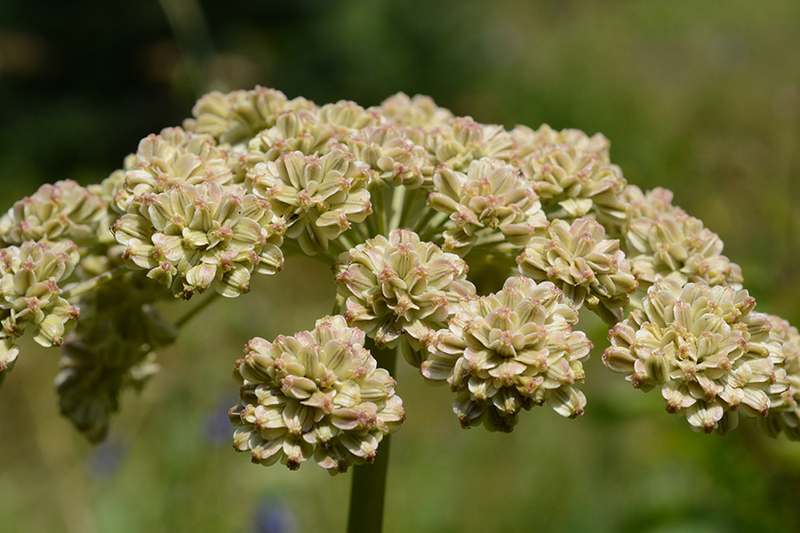 While individually inconspicuous, the tiny flowers arranged all along the slender stalks add up to quite a show. 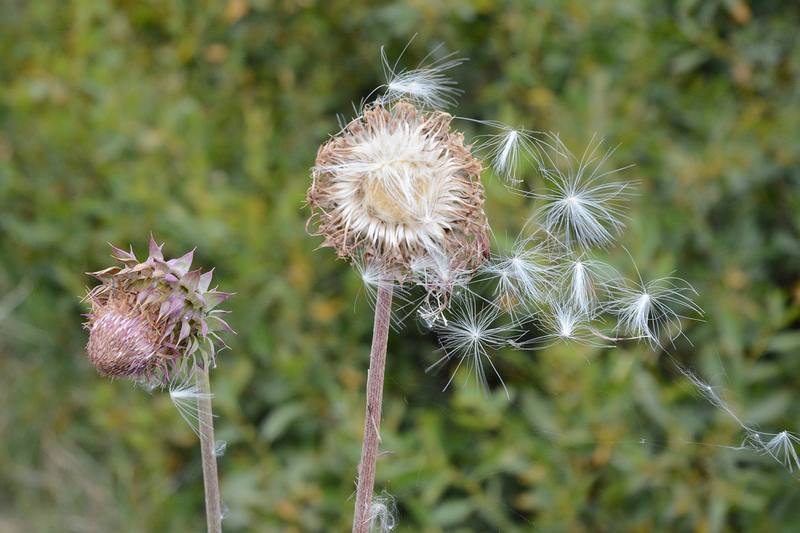 They disperse millions of tiny pollen grains upon the wind. Such light and plentiful pollen is a source of allergies in humans. 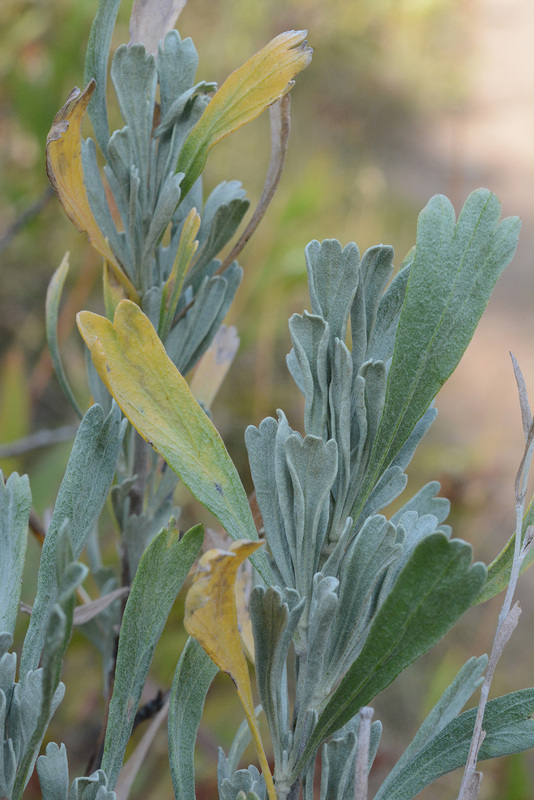 Also, observe Big Sagebrush leaves. The larger ones produced when water was plentiful in spring are dying off, but the smaller leaves of early summer will remain throughout the winter. The shrub is evergreen. These leaves are essential to the survival of Sage Grouse. 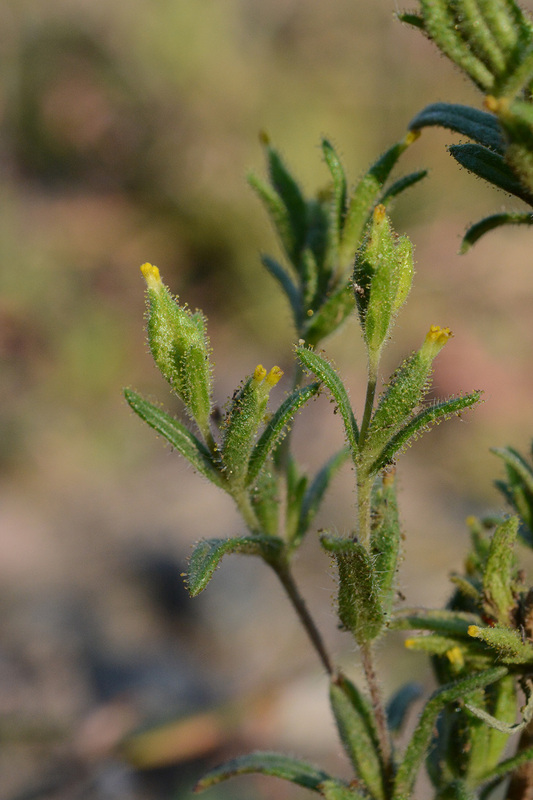 Often only six inches high, Tarweed – Madia glomerata – is easily crushed underfoot, releasing an intense smell reminding some people of tar. The glandular hairs containing the scent are a defense mechanism to deter grazing animals large and small. It is interesting that some people like the fragrance while others find it pretty stinky. In fact plants vary in their chemical arsenal. While many grazers avoid the plants, honeybees use the pollen and ground squirrels eat the protein-rich seeds. 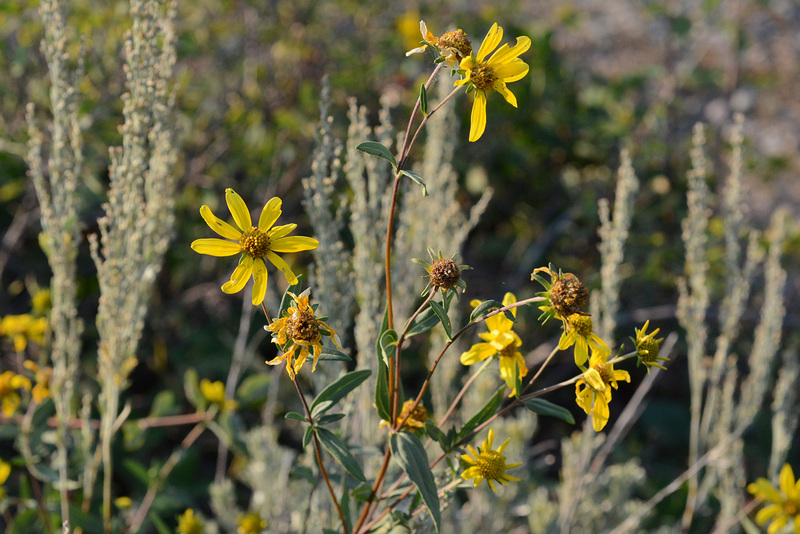 Tarweed is a native annual that is used in habitat restoration efforts. A. Look closely: the two sides of the horizontally splitting fruits are each flat with 3 ridges on the back and wings to the sides. A. 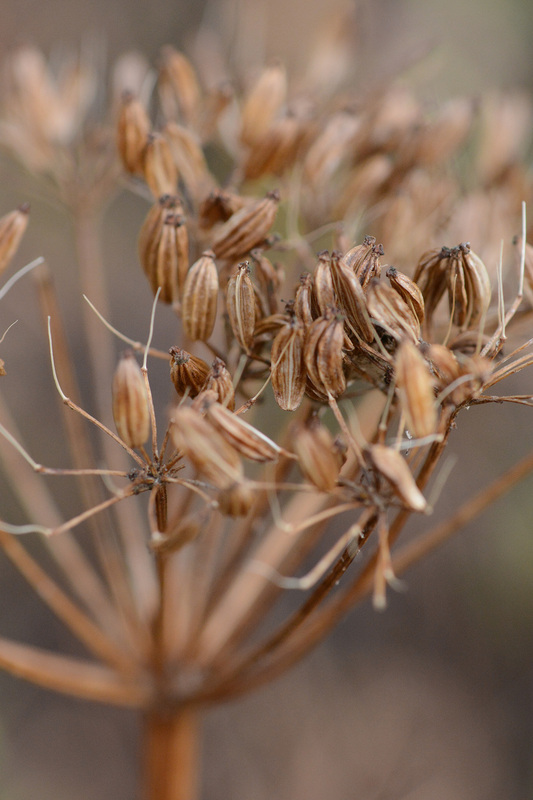 The umbels of fruits stand 5-6′ feet high on smooth stems in moist locations. B. Another hint: the roots of this plant are favored by bears. Note the splitting of the individual fruits. Also the stylopodiums: the swollen, persistent bases of the stigmas. C. Two to three-foot plants of forest edges and meadows hold up elongate smooth, purple black fruits. Note the beige central stalks (lower left) that held the two sided fruits which were flavorful when younger. D. These slightly curved, ridged schizocarps are more or less oblong. The large compound leaves are finely dissected. E. These fruits are very flat with two to three decorative lines. The plants are very large, coarsely hairy, and grow in moist areas. Last and not least, especially for the birds, bears, and small mammals of Jackson Hole, are the fruits of the Rose Family. When investigating the wild fruits, first consider your cultivated apples, cherries, peaches, plums, etc, which are relatives. The flesh you are eating is actually the swollen base of fused sepals and petals and even anthers surrounding an inferior ovary in which seeds (pits or individual seeds) form, e.g. you are eating the ripened “hypanthium”. 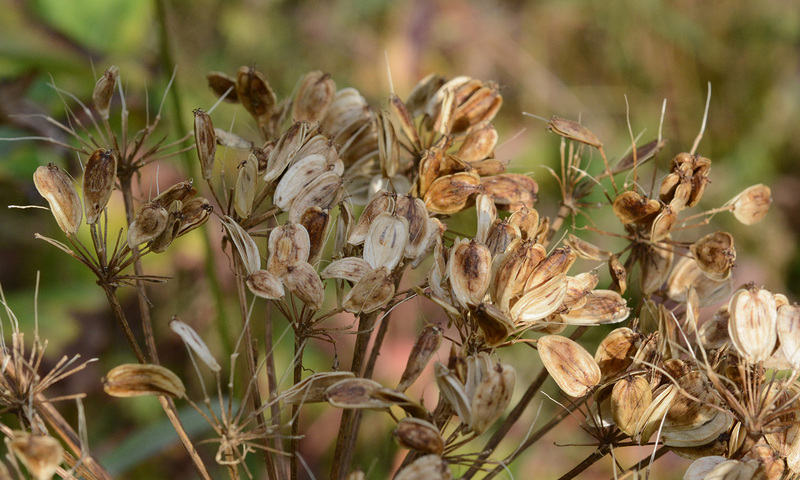 This fleshy juicy part is what most birds and mammals consume as well, although some rodents chew upon the hard coated seeds. The tasty fruit is the “reward” for dispersing the seeds. 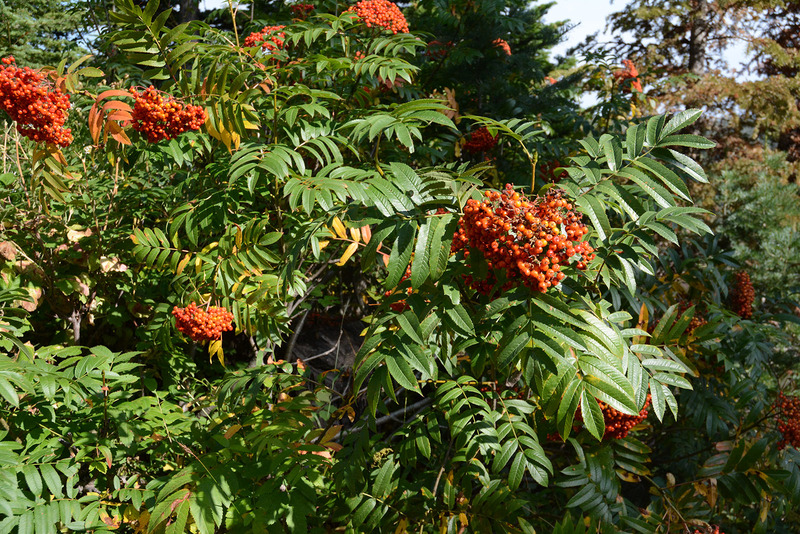 Mountain Ash – Sorbus scopulina – decorates the beginning of Ski Lake Trail and various canyons. Note the shiny compound leaves, as well as the heavy clusters of orange fruits. 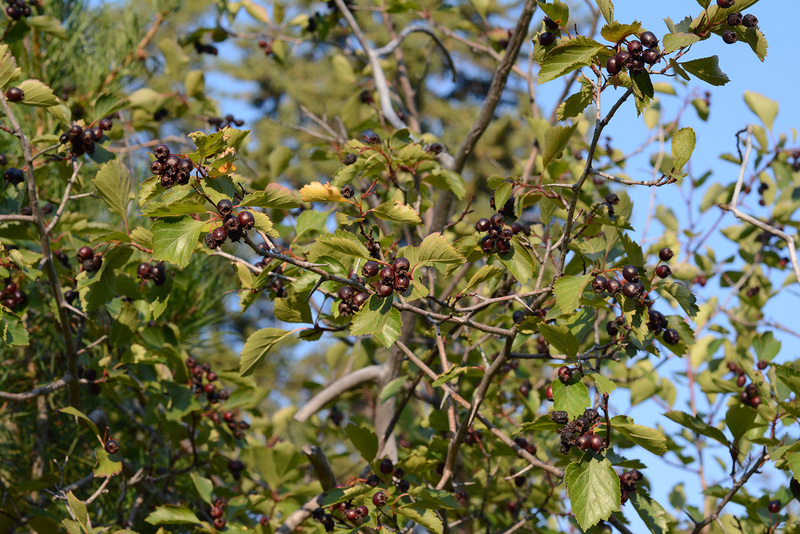 Hawthorn trees – Crataegus douglasii – are filled with bunches of dark fruits protected (supposedly) by 1-2” long thorns. No wonder people are seeing black bears along the Moose-Wilson Road where this plant is particularly abundant. Do be careful hiking around berries of any kind right now. 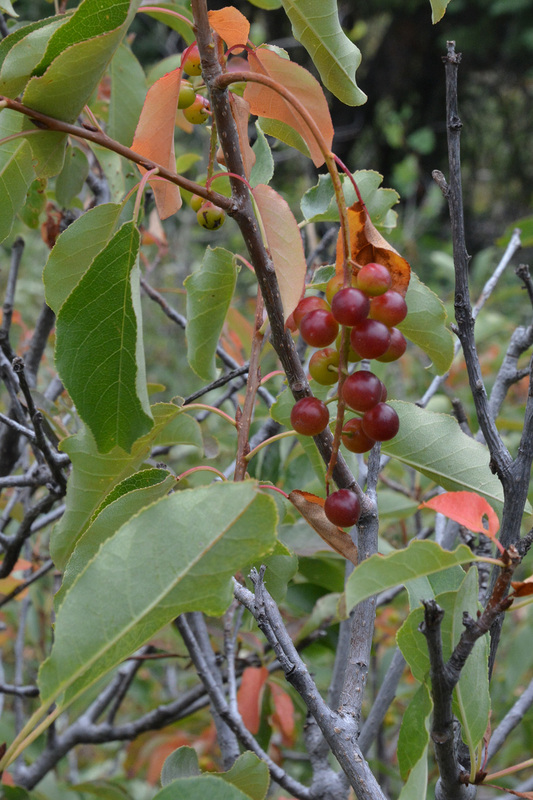 Fruits of Chokecherry – Prunus virginiana – are arranged in a raceme, e.g. 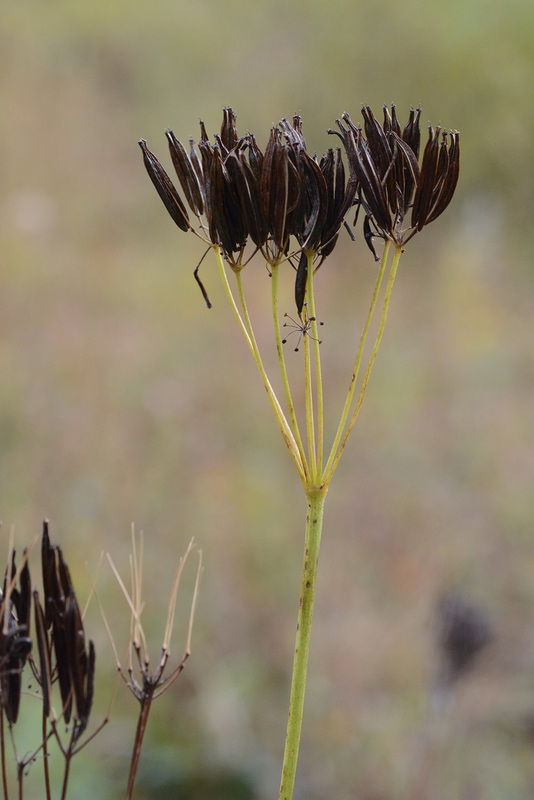 fruits dangle on short stems from a long central stalk. If ingested by humans or livestock, chemicals in the pits and leaves convert to hydrocyanic acid which inhibits cellular respiration and the ability to use oxygen: in short they are poisonous. On the other hand, the fruits, are relished by many animals (which excrete the pits) and numerous insect species overcome the defense systems. Plants may or may not be poisonous to different species, and in different life stages. This plant is very important for sustaining biodiversity. 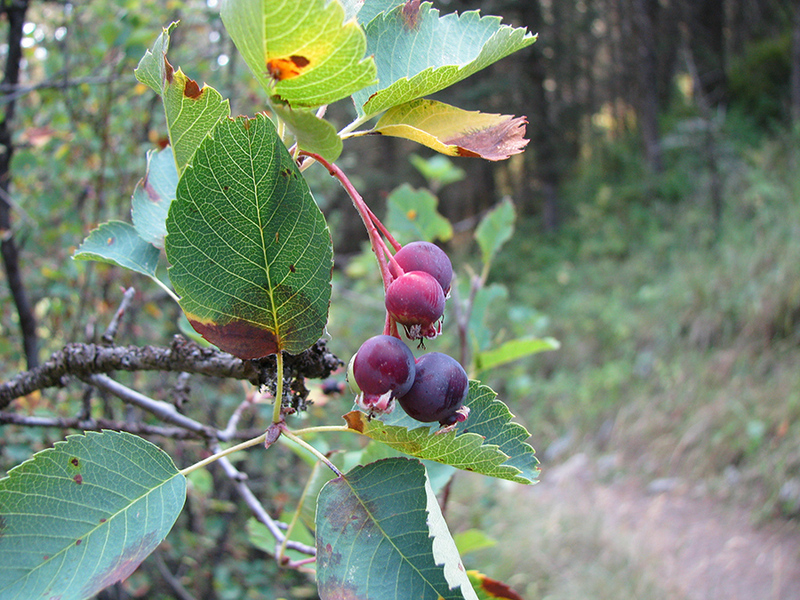 Serviceberries – Amelanchier alnifolia – still retain some red-blue-purple fruits, although many birds such as American robins, cedar waxwings, and western tanagers, have already consumed them to fuel their migration south. 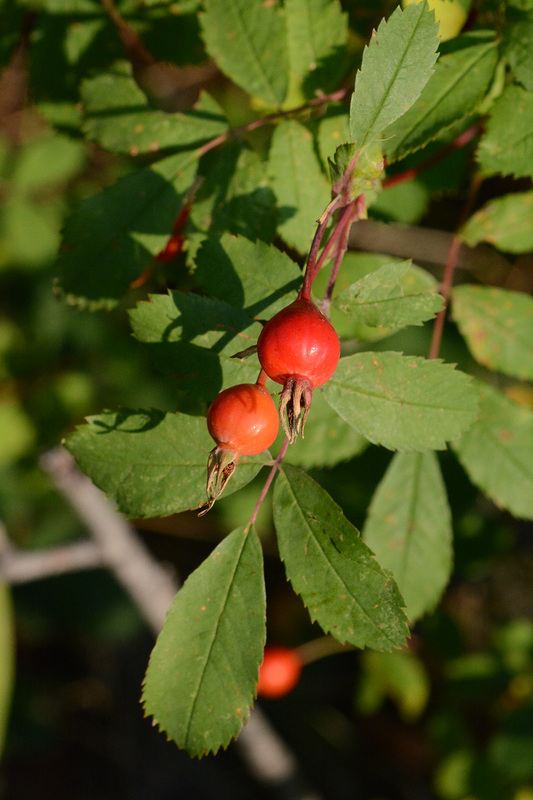 Wood’s Rose – Rosa woodsii – holds several fruits at the tips of twigs. Rose hips are particularly high in vitamin C, perhaps as much as 60x as much as lemons….but who really eats lemons? These fruits will last on the plants through much of the winter, providing food when other resources are scarce. 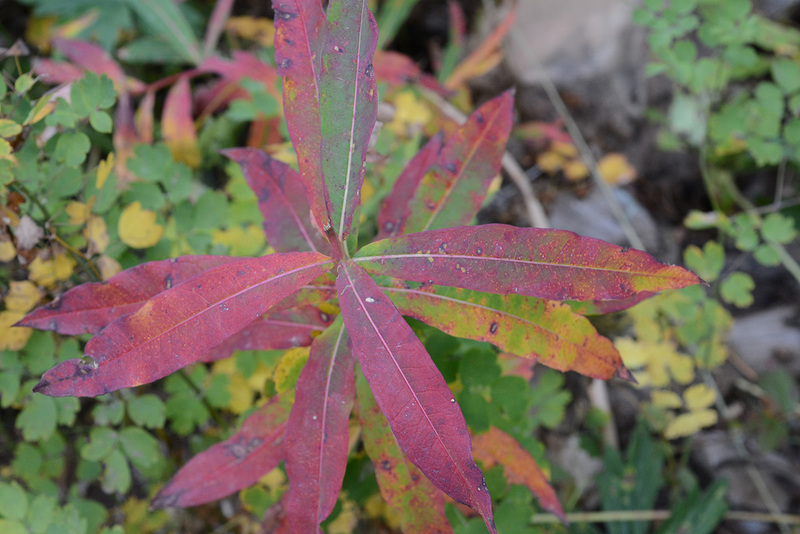 Fireweed – Chamerion/Epilobium angustifolium – is the traditional harbinger of autumn. 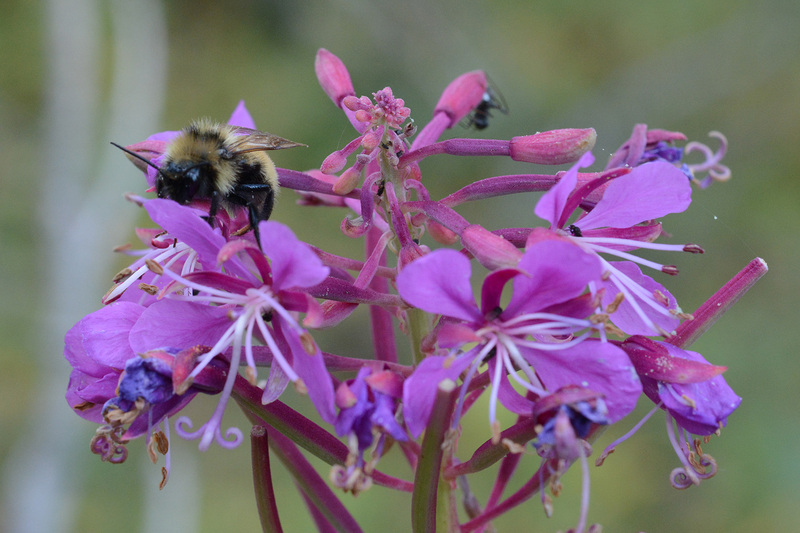 Fireweed is almost finished blooming, with bumblebees garnering the last bits of pollen and nectar. 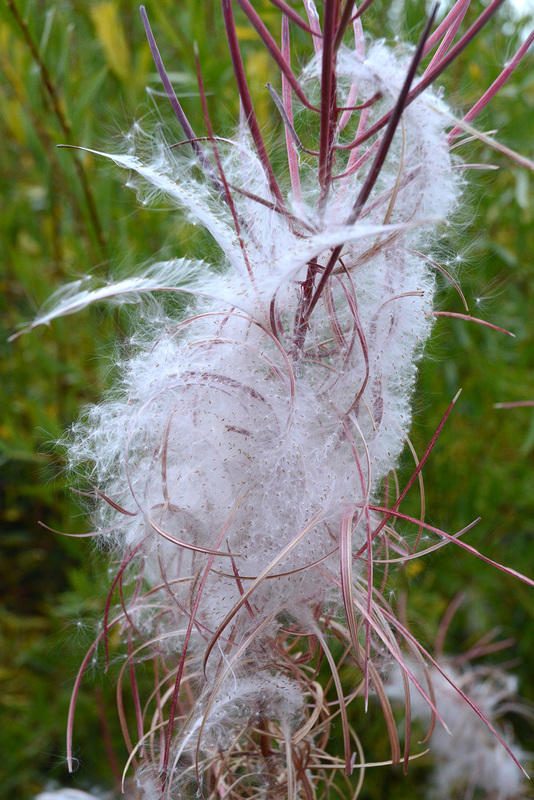 The elongated fruits of Fireweed have burst into a whirlwind dance of seeds dispersing. The crimson leaves provide an encore before hard frost. Plants can be enjoyed in all seasons for their flowers, fruits, leaves, bark, structure. Observe closely and celebrate the cycle of the year. 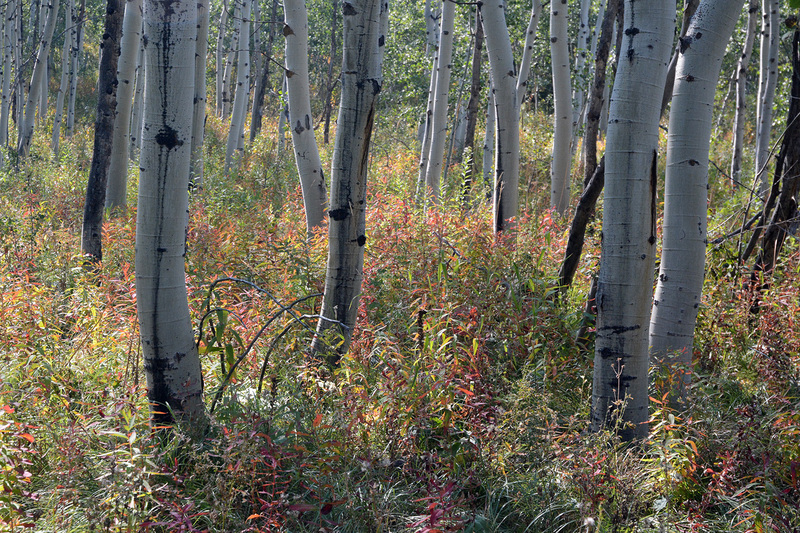 Aspen groves on Munger Mountain are full of fall treats. Some cultures revere the beauty of aging. 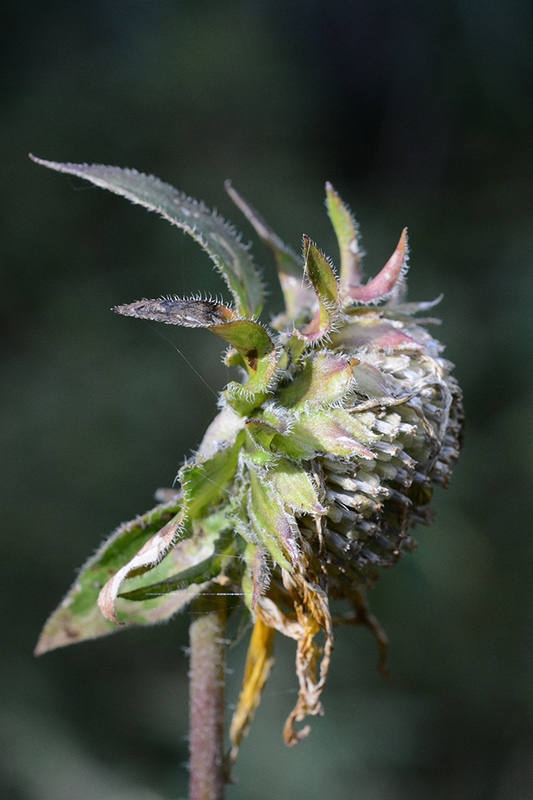 Here is a dignified, grizzled head of the statuesque Five-nerved Helianthella – Helianthella quinquenervis. P.S. 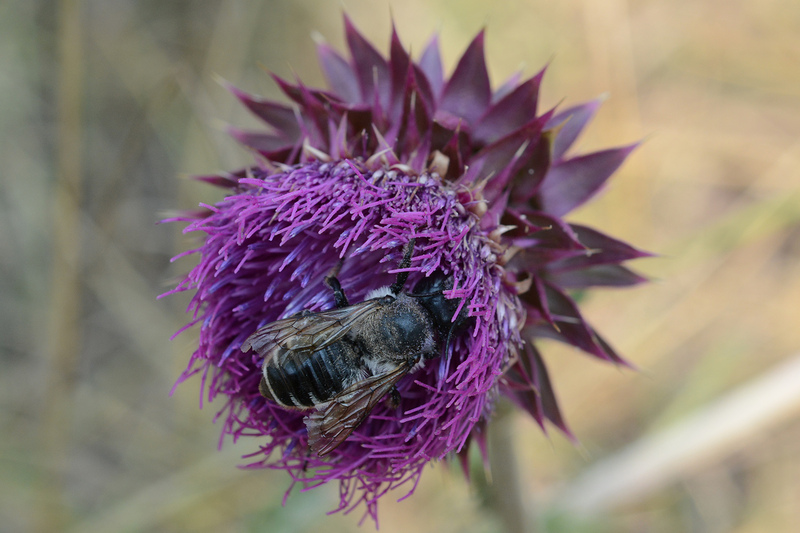 This blog is designed to encourage further exploration into the wonders of our native plant world. As always, we appreciate you comments, additions, and corrections.